How much does it cost to travel to Florianopolis? How much money will you need in Florianopolis? R$58 ($15) is the average daily price for traveling in Florianopolis. The average price of food for one day is R$13 ($3.36). The average price of a hotel for a couple is R$60 ($15). Additional pricing is in the table below. These average travel prices have been collected from other travelers to help you plan your own travel budget. How much money do I need for Florianopolis? With a population of almost 500,000, Florianopolis is the capital city of the state of Santa Catarina in southern Brazil. The city is split between mainland Brazil and Santa Catarina Island. Florianopolis has grown in popularity with tourists recently because of its wonderful scenery, beautiful beaches, and fascinating culture. Many Brazilians have also moved here, leaving behind the big cities of Sao Paulo and Rio de Janeiro. Florianopolis has a warm humid subtropical climate. There are summer, winter, spring and fall seasons. Frosts are rare but do occur occasionally. Highs during the warmest months are usually in the high 70s Fahrenheit. Rain is evenly distributed throughout the year and there is no distinct dry season. Sights within the city that you should consider visiting include Catedral Metropolitana, which is arguably the most beautiful building in the city, the municipal market, and Teatro Alvaro de Carvalho, built in 1870's architecture. Hercilio Luz Bridge is a symbol of the city and dates back to 1926. There is also a large lake at the center of the island, Lagoa da Conceicao. There are four major forts around town: Fortaleza de Nossa Senhora da Conceicao, Fortaleza de Santo Antonio, Fortaleza Santana, and Fortaleza Sao Jose da Ponta Grossa. The center of Florianopolis is where you'll find most of the churches, museums, and colonial architecture. On the island, the northern area is most frequently visited by tourists. The southern part of the island is where you'll find the most preserved Azorean customs that date back to the 18th century. Most people go to Florianopolis for its beaches. There are a total of 42 beaches in the area. In the north, the most popular beaches are Canasvieiras, Praia Brava, Jurere (and Jurere Internacional), Praia dos Ingleses, and Ponta das Canas. 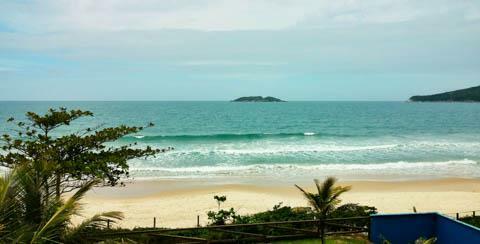 The most famous beaches in the east are Praia Mole, Praia da Galheta (a nudist beach), Barra da Lagoa, Praia da Joaquina, and Praia Brava. To the south the most famous beaches are Campeche Armacao, Matadeiro, Pantano do Sul, Solidao, and Saquinho. Florianopolis has plenty of shopping, restaurants, bars and nightclubs, which keep travelers entertained and busy. Facilities continue to grow and become more glamorous as the popularity of the area grows. If you're looking for a good party, the beaches are the place to go during the summer months when tourists gather at the nearby bars. In the winter months you're more likely to find a crowd at Lagoa da Conceicao, which actually has a higher concentration of bars and clubs. Whatever the season though, you can usually expect a good time when you head out on the town. If you're interested in surfing then it's better to head to the eastern beaches. On the south side of Santa Catarina Island you will find some beautiful isolated beaches that can only be accessed by walking trails. A major attraction of the island is also Lagoa da Conceicao, which is shallow with high winds, making it ideal for windsurfing. There are many high end restaurants around town that offer some great seafood. Alternatively, you can find many budget restaurants as well, which are usually decent in quality and reasonably priced. There are some decent international restaurants as well. Florianopolis has an airport about 12 kilometers from the city center. It is connected to the city by local bus or taxi. There is also a central bus station where you can catch a bus to most of the larger Brazilian cities. The best way to access the beaches from the city's center is by bus. Buses are usually comfortable and reasonably priced. It may be necessary to transfer buses at some point and the wait times can be frustratingly long. On average, it takes about half an hour to an hour to get from the city to the beaches, but on occasion trips may take several hours due to long wait times. It's also possible to take Linhas Executivas from the downtown to the main beaches. These are yellow colored, air conditioned buses that are relatively convenient. If you want to explore the beaches in depth, then it is recommended that you have a car. You can rent cars on the island and at the airport, but this can be expensive.